They say to never judge a book by its cover, yet it seems like that is exactly what young boys are doing. In 2016, Scholastic conducted a survey on over two thousand US children ages six to seventeen and found that when it came to reading, boys generally do not like it as much as girls do. 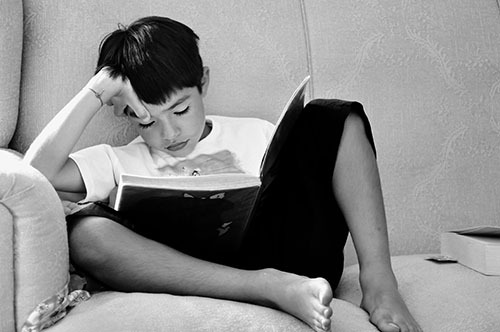 Only 52 percent of boys said that they liked to read over the summer, compared to 72 percent of girls. And 45 percent of boys stated that they had trouble finding books they liked. But why is this? Why are boys having so much trouble finding books to read? There’s certainly no shortage of books with male protagonists in them, yet for some reason, young boys are just not connecting with books in the same way girls are. There are a myriad of reasons for why this could be, but one thing I believe plays a big factor in this reading gap is gendered book covers. Just take a look at the covers lining the shelves of the young adult section at any bookstore. Many of them feature characteristics like female characters on the cover, loopy and swirling fonts, and bright “girly” colors. By engendering covers, boys have a hard time identifying with them, which makes it less likely for them to be interested in reading them. The neutral color scheme depicted on the cover of Sleeping in My Jeans allows Connie King Leonard to share a powerful story about family, perseverance, and homelessness with all readers. The dark, hazy images on this cover make The Raven Boys by Maggie Stiefvater look like a thrilling and mysterious read for all. The rainbow-hued geometric cover of Warcross by Marie Lu suggests a thrilling, sci-fi adventure. The perfect book for any gender. These are just a few examples, what covers have you seen recently that seem to be marketed more towards both genders?